Regularly adding quality content to your website or blog is a good SEO strategy. Google sees that your website is active because new information is added and you increase the volume of your content. If you have crafted your keyword strategy properly and your content is nicely optimized for the right keywords, adding content will increase your findability. But how do you choose the perfect focus keyword or focus keyphrase? Especially when you’re blogging and focusing on long tail keywords, it can be difficult to decide which keywords to optimize for. In our view, there are at least three things you should do to determine which keywords or keyphrases you should optimize your blog posts for! Read about them here. 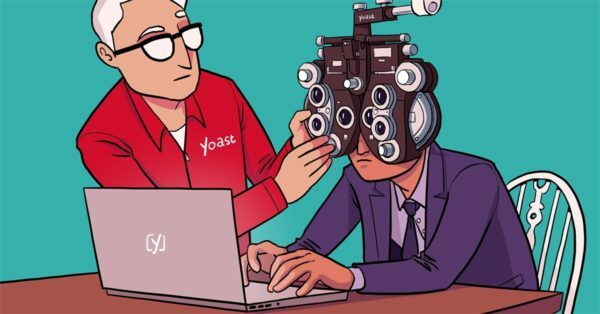 Did you know you can optimize for a focus keyphrase much better with Yoast SEO Premium? It recognizes multiple word forms, has support for synonyms and for related keywords! What is the focus keyword/keyphrase? The focus keyword – or keyphrase – is the search term that you want your page to rank for most. So when people search for that phrase, they should find you. Yoast SEO it has its own input field for this. The plugin evaluates the page’s content and provides feedback on how to improve the content for that focus keyphrase. Your keyword strategy should have given you some idea of what you want to write about. If you don’t have a keyword strategy, you should really create one. You can read our ultimate guide to keyword research or take our keyword research training course if you need help to find your perfect keywords. For blog posts, you will usually aim for a long tail keyword (containing multiple words) as explained in this guide on content SEO. 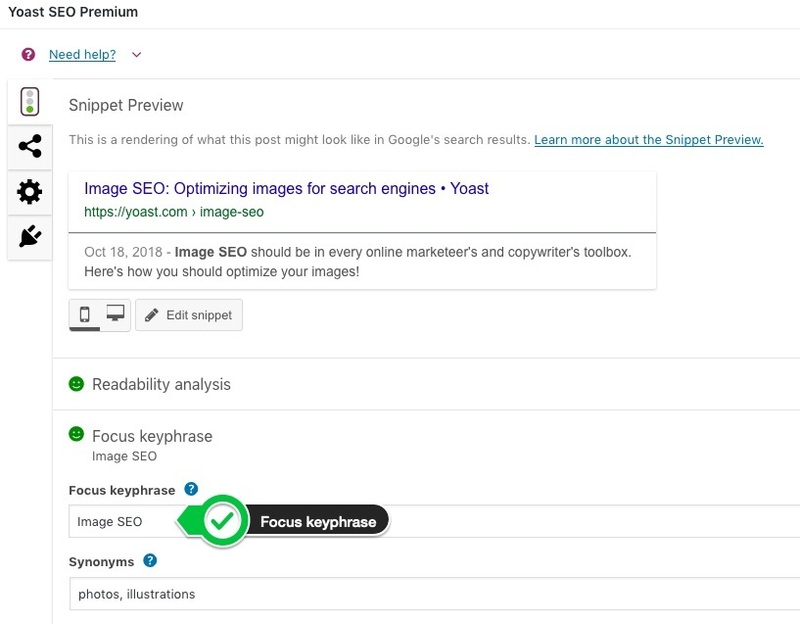 Our Yoast SEO plugin helps you to optimize your post for your chosen focus keyphrase. One of the tools you can use to find – related – keywords is our Yoast Suggest tool. This tool uses the same data as Google Suggest to find the first ten keywords and then expands on that. This is the same as what you’d see when you type the search term into a Google search box. For additional tools, see this post by Marieke about keyword research tools. The terms you will find in Suggest are terms and combinations of words that are logical and used by actual people to search on the web. This tool can be beneficial in giving you some first ideas about the search behavior of people in the area you want to write about. Use Answer the Public to find which questions people have about a particular topic. This’ll give you loads of new insights and inspiration for new posts. Once you have found a long tail search term you want to rank for, you should put some effort into discovering whether or not there are many searches for that keyword or phrase – the search volume. We will be the first to admit; Google has made this really hard. The only way to know for sure how often a search term is used is to have an active AdWords account and bid on the search term of your choice. We understand this is a bit too difficult and expensive for most of you (we hardly ever do this ourselves). Not to worry, using Google Trends should give you at least some idea, in a creative way, about search volume. Google Trends allows you to compare the search volume between two search terms over a certain time. This will give some insight into the volume of the search terms people use, relative to other terms. If you already have some (blog) posts that rank well for good terms, you will know how many visitors these posts attract. Using Google Trends to compare the focus keyphrases of older posts (which you can view the statistics for) with the focus keyphrase you have in mind for your new post, could give you some idea about the potential traffic this new keyphrase could bring. Make sure to choose older posts that are most similar to the post you’re planning to write: if you’re planning to choose a long tail keyword, compare posts with long tail keywords as well. 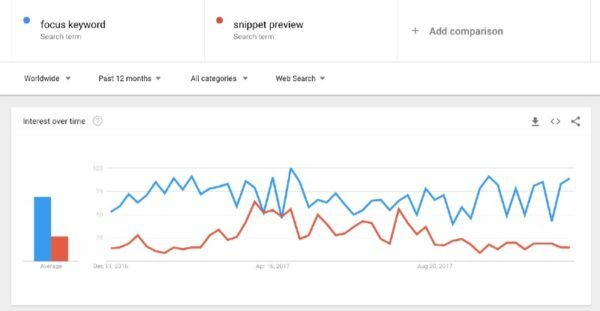 Using Google Trends to compare your old focus keyphrase or keyword and the one you want to use will give you some insights about the prospects for your focus keyphrase. Another good way to use Google Trends is when you are considering a number of (long tail) focus keywords. Because it will easily show you which search term will have the highest search volume compared to another. Therefore, it will help you decide which long tail keyword is most commonly used in search. Apart from knowing which search terms are actually used by people, you need to know whether or not your idea for your post or page fits the needs and expectations of the people who use these search terms. The best way to find out whether or not your content meets their needs is to Google your proposed (sets of) keywords yourself. Take the time to look at the first two result pages. Are the articles in the Google results of similar character to your article? Could your article fit the results shown in these search pages? If you decide to write your blog post or page, while optimizing for this exact focus keyword, you are aiming to get your post amongst these results. We also saw lots of questions on the WordPress forums, giving us all the more reason to write this post. Note that we looked at the old post and decided it wasn’t good and complete enough, so we decided we would delete it and replace it with this one. Be sure to use the content of the result pages as an inspiration for your blog post. Are there any useful ideas? We are NOT encouraging you to copy content, merely to see whether you perhaps missed some information or arguments for your own blog post. But more importantly: how can you make sure your post will stand out? In what way could your post be better, funnier, more original than the post presently displayed in the result pages? Try to come up with content that will make the audience click and share! Should every page have a focus keyword? People often ask us whether their about page or contact page should have a focus keyword, and, if so, what should it be? The answer is easy: not every page needs a focus keyword. Your contact page should be easily reachable, it might, for instance, need to rank for “<company name> address.” That probably doesn’t make sense as a focus keyword though, and it’s perfectly fine to leave it empty. Choosing a perfect focus keyword or keyphrase is not an exact science. You should aim for a combination of words that are actually used by a search audience. Aim for a keyphrase that is relatively high in volume and one that will suit your audience. I am looking for for you to improve my website thank to keyword and so other thing such as pulgin and even other technically available. More once I truly thank for everything you to do for our company. Best Merry Christmas and happy new year. how i can get focus keyword automatically ? if i have 100.000 post ? and i used rss in my site ? Very informative post, this will improve individual page’s ranking. Long tail keywords linked to a little crowded niche are a goldmine in SEO maria! Great article! Very informative one. Nice guide on focus keyword perfect use. I will definitely implement these techniques in my own website. Thanks, Joost de Valk for such a nice article. Thanks for the great article guys, it will be definitely helpful for my business. Keep up with the good work. keyword is very important for SEO building as backlinks are. While choosing keywords, keep in mind that keywords have less content volume over the internet while its search volume is high on daily basis. Now if you write a technically strong, lengthy article on that keyword, there will be a great chance that your article will be indexed very soon. You’re absolutely right, Asad. Keep it up and you’ll get there! 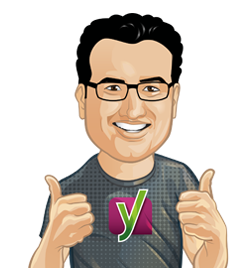 I really follow Yoast it’s improved my post. This is one of the most excellent for SEO WordPress developer, well described how to focus on the top audience keywords which is most important. Alos today I know two most important thing in the field of SEO. I write always long posts on my blog but its hard to choose focus keyword for the blog posts. Thank you very much for the great help. I really love the Yoast plugin. I have been using your plugin for a while now, and when I first installed it I had a lot of problems. Now I can say I am in the green and hope to see improvements in the serps. Whenever I have a problem or question I can guarantee that the answer is right here. Again this article helped me. Thanks! We’re glad you’re enjoying our work. hello, i am using yoast seo , but not pro version. i want to rank for about 7 – 8 kw, but for standard package of yoast it is very difficult to me control all of these keywords. can i use only one focus kw and other use in text body? do they rank also? can you advice me something?